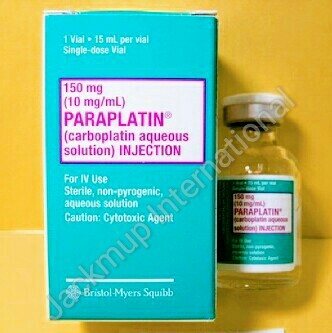 Description:- Paraplatin 150mg injection is used in the treatment of ovarian cancer and small cell lung cancer. Paraplatin 150mg injection works by damaging the genetic material (DNA) of the cancer cells and stops their growth and multiplication. Neurological and hearing assessments may be required on regular basis during treatment with high doses of carboplatin. It is generally recommended that aluminium containing equipment not be used for delivering carboplatin. Concurrent treatment with following medications is not recommended: amino glycoside, vancomycin, capreomycin and diuretics. There might be low numbers of platelets or white blood cells during therapy and hence, frequent monitoring of blood cell counts and transfusions of the same may be required. Call your doctor immediately if you experience any of the following during the therapy: fever, sore throat, chills, ongoing cough and congestion, or other signs of infection; unusual bleeding or bruising; black and tarry stools; red blood in stools; bloody vomit; vomited material that looks like coffee grounds. Women who are planning to become pregnant should use two methods of contraception while on this therapy and 6 months after it. Men who are going to use this therapy should not father a child while on this therapy and 6 months after stopping. They should also seek guidance and counselling on sperm conservation before taking this therapy.